Decca has released a remarkable performance of Massenet’s great romantic tragedy Werther . 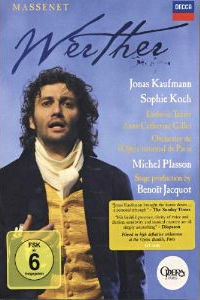 Filmed live in January 2010, this performance stands out primarily for the great singing and dramatic vitality of the principals, particularly the remarkable Werther of Jonas Kaufmann. It is rare to hear a tenor voice with this much heft, body and color phrase and shape musical lines with such lyricism and pathos. High notes ring out thrillingly or shimmer with retrained longing, as needed, and Kaufmann dramatically embodies this tortured soul to the point that it is hard to separate singer and part. Add Mr. Kaufmann’s matinee-idol good looks, and there is not much else to say. Sophie Koch’s nicely realized Charlotte is also highly enjoyable. Charlotte is a difficult part to cast, with simplicity and directness to her vocal writing in Acts One and Two that belie the range and dramatic heft required by Acts Three Four. The same thing applies to the character. The sweet, innocent young woman we see at the start also has a will of iron. She throws away her own chance of happiness in order to do what she thinks is expected of her. Then, as the disastrous consequences of that choice unfold, she at first finds the strength to resist a love she can scarcely acknowledge, and finally finds the courage to surrender to that love, flying to his side in a moment that always reminds me of Jeanette MacDonald running through the snow trying to reach Nelson Eddy in Maytime. Anyway, Ms. Koch gets a lot more of this right than most. To begin with, she possesses a beautiful, clear, firm mezzo soprano voice that she wields with ease and technical security. She is also a fine actress, illuminating this complex young woman from the inside out. If her singing is not quite at the exalted level of her male colleagues, her performance is still something to savor. As Albert, baritone Ludovic Tezier makes a big impression in what is normally a “throw-away” part. Scenes that normally pass by unnoticed, like the confrontation with Werther in Act Two, have real dramatic weight and vocal heft, and propel the story forward in a stronger, more convincing way. Andreas Jäggi (Schmidt) and Christian Tréguier (Johann) play the town drunks. I only mention it because they provide a text-book example of “how to” and “how not to” be a good comprimario. Mr. Tréguier gives a lovely performance. He is charmingly funny, does a very convincing drunk, sings well, always stays in character, and keeps his shenanigans within the context of the rest of the production. Mr. Jäggi on the other hand, gives one of the most annoying, heavy-handed, over-sung, over-the-top, out-of-control comprimario performances I’ve ever seen. Not surprisingly, Maestro Michel Plasson leads the orchestra with a sure hand, and they play with style, grace, beauty and élan. Just wonderful! The production, by Benoit Jacquot, was created at Covent Garden in 2004. His set designs tend toward big, sparse and slightly surreal, but he guides the stage action with a clear understanding of dramatic pacing and visual story telling. This makes his ill-conceived, wrong-headed choices as video director all the more surprising. Partnering with Louise Narboni, he decides to constantly cross-cut images of the action on-stage with preparations going on backstage during the performance! For example: Just before Werther’s entrance, we are treated to a shot of Mr. Kaufmann standing backstage with this dresser putting on his glasses, fluffing his hair, checking his costume, etc., before an abrupt cut to him entering a scene already in progress onstage. Most of the time the off-stage demeanor of the cast is in direct contrast to the mood onstage, and the presence of 21st century stage hands dealing with 21st century stage craft creates a constant, awkward, anachronistic juxtaposition of “illusion” and “reality” that goes a long way toward ruining the video. Fortunately, the remarkably high level of singing and music making ultimately carry the day and make this a “must-have” for opera lovers.